The San Francisco Business Times writes about how UCSF is a pioneer in using social media to raise awareness of dementia and increase participation in clinical trials. Another goal of the "Defeat Dementia" campaign was to target Silicon Valley philanthropists. I am interviewed for this article. "What I seeing UCSF doing is remarkable," says YouTube's Obie Greenberg. "They're so focused on specific diseases and specific audiences." The University of California, San Francisco, is using a new YouTube channel and a Facebook group to communicate with patients, concerned family members, physicians and — just as important — potential donors, as it begins to explore the brave new world of social networking. And other local hospitals are beginning to move in the same direction. 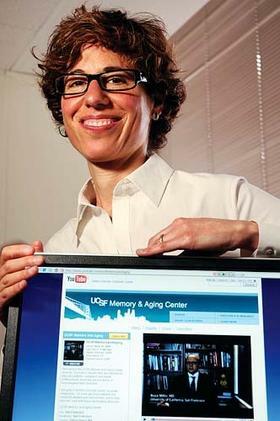 UCSF's new YouTube channel incorporates videos about Alzheimer's, Creutzfeldt-Jakob disease and other forms of dementia that were produced by its Memory and Aging Center. The move is seen as a first step in exploring new ways of communicating with external audiences and finding potential participants in clinical trials. But another key goal is reaching out to Silicon Valley's huge pool of potential philanthropists, as UCSF starts to gear up to raise $500 million in donations for its planned women's, children's and cancer hospital at Mission Bay, and another $1.5 billion for other capital projects. "From a marketer's perspective, the world is changing," said Aimee Levine, UCSF's assistant vice chancellor for public affairs. "The way we tell our story needs to change, to reach different audiences." Obadiah Greenberg, YouTube's strategic partnership manager for academic institutions, said universities nationwide are beginning to make similar moves, including UC Berkeley and Stanford University locally, and Duke University, the University of Wisconsin and the Mayo Clinic further afield. "But what I seeing UCSF doing is remarkable. They're so focused on specific diseases and specific audiences." Stanford and its School of Medicine have about 150 videos posted on YouTube, and Stanford Hospital & Clinics plans to add others this fall, said hospital spokesman Gary Migdol. Like UCSF, Stanford has massive capital projects under way, including a $2 billion expansion and upgrade of the neighboring Stanford and Lucile Packard Children's hospitals. "We're not currently using any of those (Internet) sites," said Amelia Alverson, Stanford Hospital's vice president of development, "but we are exploring opportunities in various types of new media." Steve Mangold, president and chief operating officer of PRx Inc., a San Jose-based public relations, marketing and branding firm, said use of social networking media is more common among nonprofit groups that focus on a specific disease than hospitals. "There's a reluctance among many health-care organizations to invite a lot of public comment," he said, "because you have to vet the information you put online." Even so, PRx client Santa Clara Valley Medical Center is using YouTube to enhance communications with patients, family members and potential donors, and has been doing so for nearly a year. The cash-strapped hospital — Santa Clara County's public hospital and primary trauma center — took the step because its nonprofit fund-raising arm, the Valley Medical Center Foundation, "took a chance" on YouTube and other new media to spread the word about the hospital's services and other health tips, said Chris Wilder, the foundation's executive director. In terms of philanthropic outreach, "mostly it's seeding the ground, but we have received a few donations from people who have seen our videos," Wilder said. Levine, meanwhile, said UCSF is pleased with the attention it's garnering on the new YouTube channel, Facebook and various Silicon Valley blogs, and predicts that its nascent social-networking campaign is destined to grow. "YouTube is a great aggregator of audiences, but it's also viral," she said. "People take links from YouTube and put it on their sites, and imbed it on their blogs," giving the message broader reach. A big part of the new strategy is "generating awareness for the brand and supporting our donor efforts," Levine added. She said UCSF needs to cast a wider net to find philanthropic givers, in the region, Silicon Valley as well as in Fresno (where UCSF has an affiliated medical education program), Palm Springs and other potential hot spots for wealthy donors. More than $7 million has already been raised to fight Creutzfeldt-Jakob disease as part of the "Fight for Mike" — Silicon Valley tech marketing guru Mike Homer, who was diagnosed with the deadly disease last year. Homer, and his volunteer "Fight" group, helped inspire UCSF to use the web to spread information about CJD and other diseases, as well as mobilize funding and research. About $200,000 of that CJD funding was used to create a web site, in conjunction with the YouTube channel, that can serve as a template for other disease-specific dementia-related sites.